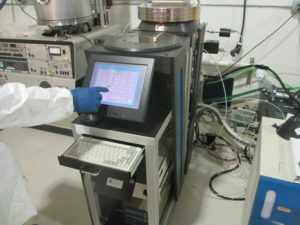 The Trion Technology Minilock-Orion II is a Plasma Enhanced Chemical Vapor Depositon (PECVD), vacuum loadlock system that produces production-quality films. The unique reactor design produces low stress films with excellent step coverage at low power levels. The system meets all safety, facility and process requirements within the lab and pilot line production environments. This system could also be used for other Plasma or RIE applications as well. Films deposited: oxides, nitrides, oxynitrides, amorphous silicon and silicon carbide. Process gases: silane, ammonia, TEOS, diethylsilane, nitrous oxide, oxygen, nitrogen, trimethylsilane and methane. The cathode and anode are each machined out of single blocks of aluminum and are hard anodized for protection from process chemistries. Process gases are introduced into the chamber by a showerhead manifold. Bottom Electrode: 300-500Watts (350-460 kHz). The PC process controller provides simple and reliable system control. The graphical software package creates programs in block diagram form. Process recipes are stored on the hard drive. Bottom electrode temperature can be controlled using a resistive heater and IR thermo-couple. • 6 MFC’s in the gas cabinet—typical gases used are CF4, O2, TEOS, DES, NH3 and N2 for purge. • A ceramic ring focuses the plasma, thus optimizing power utilization. • The bottom electrode and the top electrode are water cooled to maintain a consistent temperature during processing. • The chamber is equipped with a two circular quartz viewing windows for observation of the plasma process. • The primary chamber material is anodized aluminum; other components are manufactured from ceramic and quartz. • Includes Edwards Drystar dry vacuum pump QDP40. 230VAC, 3 Phase pump. The system can be seen and tested at our lab in Tempe, AZ. The system has been tested, and is ready for your inspection/testing in our lab. The computer and software was recently installed and tested at Trion Technology. Trion Technology can be contracted for installation and service support.